Australia ODI Home Kit 2014 Patch for Don Bradman cricket 14 now released. 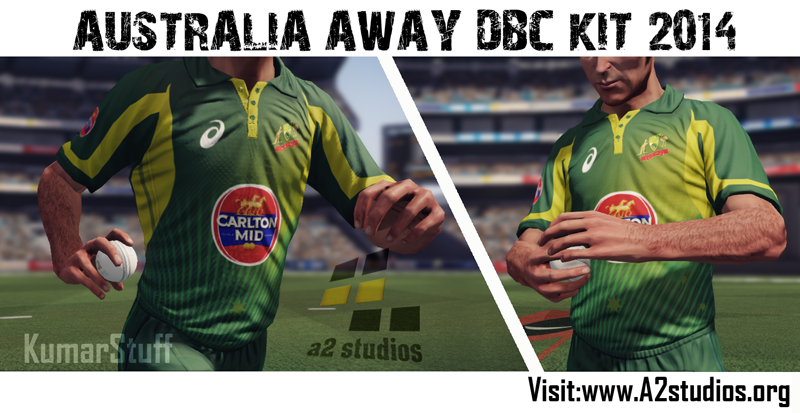 Download A2 Studios Australia ODI Home Kit 2014 for DBC 14 Now. The HQ Kit is a must download for your new Don Bradman Cricket DBC14 Game. Must try it and let us know if you liked it! Download Links Given below. Read out instructions and carefully follow them, otherwise you will not be able to install it! 1) Extract the archive to a folder of your choice. Copy "pattern_05_col.dds" to "\Documents\My Games\Don Bradman Cricket 14\textures\characters\tops\Current_01” Paste it. Copy "pattern_09_col.dds" to "\Users\XXXX\Documents\My Games\Don Bradman Cricket 14\textures\characters\pants\Current_01". uni_plan_dark " to "\Users\XXXX\Documents\My Games\Don Bradman Cricket 14\textures\characters\sponsors". f_austr " to "\Users\XXXX\Documents\My Games\Don Bradman Cricket 14\textures\characters\emblems". 6) Launch Don Bradman Cricket Academy, go to "Team Manager" and select "AUSTRALIA (Current Generation)". 7) Select "Identity" and make sure you have the team sponsor set to " PLAN_dark ". Set the Top Model to "Current 01" and pattern to 05. Set the Pants Model to "Current 01" and pattern to 09.